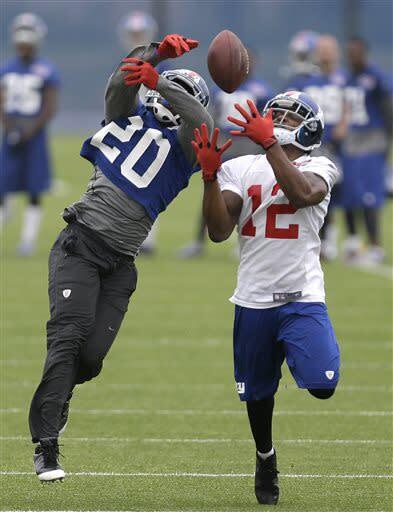 EAST RUTHERFORD, N.J. – As if the New York Giants and Victor Cruz weren't involved in enough of a stare down, fellow wide receiver Hakeem Nicks sent the team a little message by not showing up for practice Wednesday. Pay day is coming soon for Nicks, too. That was the unstated goal of Nicks' not attending the Giants' organized team activity practice, a team source indicated Wednesday. However, Nicks' agent Peter Schaffer strongly denied that the wide receiver missed the practice because of contractual reasons. Schaffer said only he and Nicks were fully aware of the reason for the player's absence and was unwilling to further discuss. Strictly speaking, Nicks didn't violate any rules. OTAs are, after all, voluntary. However, in the lexicon of NFL, voluntary is a synonym for mandatory. Even if that's an oxymoron. Then again, it doesn't take a bunch of SAT words to get the point Nicks was making by not showing up. His absence left quarterback Eli Manning throwing passes to the likes of Jerrel Jernigan, Rueben Randle and Louis Murphy. That's a far cry from the group that carried the Giants to a Super Bowl victory a little more than 15 months ago. Manning handled that situation well. He expressed only the mildest disappointment with Nicks' and Cruz's absence, saying this was an important time of year to work on timing. "You'd like everybody to be here so we can work on getting better, but you deal with what you have and go on," Manning said. It's also not as if Nicks wasn't around. On Tuesday night, Nicks was at a Giants charity function for United Way. By the time Wednesday morning came for everyone to run around in shorts and t-shirts, Nicks wasn't around. "I don't know," Giants coach Tom Coughlin said when asked about Nicks. "He should be here." Asked if he expected Nicks to be there, the irritation was obvious in Coughlin's tone. "Yeah, sure I did," the coach said. "I expect everybody to be here, trying to get our team better." Nicks, who was a first-round NFL draft pick in 2009, has one year remaining on his original contract. Cruz has been tendered a one-year, $2.879 million deal as a restricted free agent. He has refused to sign the tender, hoping to get a long-term contract worth in the area of $10 million per year. The Giants are offering a deal closer to $7 million per year and that number is important in multiple ways. 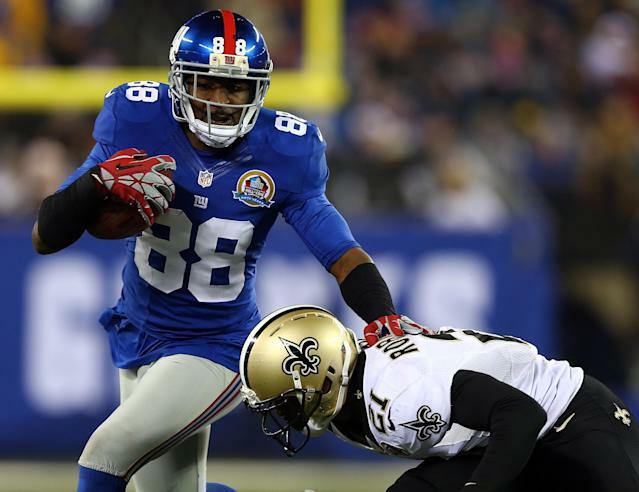 First, Cruz's contract will help set the parameters for Nicks, who the Giants consider to be their primary wide receiver – not Cruz, despite what the stats might indicate. While Cruz is a dynamic player with the speed and quickness to play either in the slot or outside, 6-foot-1 Nicks is considered more of a class matchup problem for defenses. Thus, Nicks will likely command something much closer to the range of $10 million per year, if not more. Second, the Giants have to be careful not to overpay on a player who could be replaceable. The team spent a second-round pick on Randle last season. Since being ranked the No. 2 player in the country in high school, Randle has long been considered a great athlete who is simply waiting to develop into a top-flight receiver. On Wednesday, the absence of Cruz and Nicks allowed Randle to get extensive work with Manning. "Last year was really just a whirlwind, trying to learn the playbook and understand everything," Randle said. "I'm really starting to understand it and have it slow down for me." Likewise, Jernigan had moments when he looked really sharp on routes, catching three consecutive passes from Manning at one point. Jernigan also did a nice job on a deep pass down the left side over cornerback Prince Amukamara. Although Amukamara came back to deflect the pass, Jernigan easily could have slowed down to get better position or at least draw a pass interference call if this wasn't a practice situation. "You're out there and you don't want guys running into each other, maybe getting hurt," Jernigan said. "If it was an actual game, yeah, I would have slowed down. But this was just about getting into the best position without anybody colliding." Third, fitting Cruz, Nicks, defensive lineman Justin Tuck (a free agent after this season) and defensive end Jason Pierre-Paul (a free agent after 2014), into the team's salary cap could get dicey. "Do I think about that?" Tuck asked. "Why would I? I just go out and do my job. I'm old enough to know better. You can't control it and if you try, it just gets worse." That said, Nicks was thinking about the whole situation and he was sending a message in absentia.